Kick scooters are cool now again! Whether you are an adult or buying it for your kid, a kick scooter is a great way to explore your neighbourhood on two wheels safely. You’ll get hundreds or even thousands of hours of fun with a kick scooter. What’s great is that they are very affordable as well! Now, here are the best kick scooters you can buy in Singapore today! 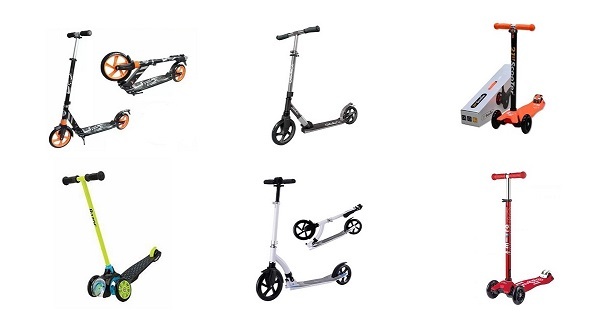 The GenConnect Foldable Kick Scooter is a high-quality scooter available at a surprisingly affordable price. It can go up to 2 times faster than older kick scooters because of improved technology. With larger front and back wheels of 230mm and 180mm respectively, you can also expect good stability even when riding on uneven pavements. The kick scooter weighs 4.8kg and can carry loads of up to 100kg which means almost anyone will be able to ride it safely. Additionally, its handlebar is adjustable to heights of 81, 88 and 95cm – suitable for kids taller than 1m and adults up to 1.95m. With an improved folding mechanism, you can fold and unfold the kick scooter within one second making it quick and convenient. If you want the best kick scooter on the market, the GenConnect is one of the top choices. 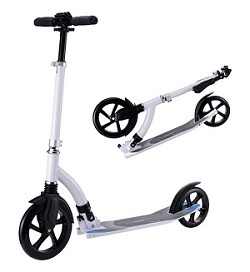 Click here to check the latest price for the GenConnect Foldable Kick Scooter on Lazada now! 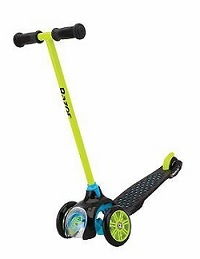 Looking for a kick scooter for your child? Check out the GenConnect Kick Scooter For Kids! There are 6 different colourful and stylish designs to choose from which your child will definitely love. It is well-designed, high-quality and safe for your kids to ride on for hours of endless fun. It weighs 3kg and can carry weights of up to 60kg. It has 2 rear wheels and 2 front wheels which helps to ensure better stability and safety for your kid when he or she rides it anywhere. Each of the wheels also lights up whenever there is movement – which makes it not only fun but also extra safe in the night. If you want a cheap and good kick scooter for your kid, this is the one to get. Click here to check the latest price for the GenConnect Kick Scooter For Kids on Lazada today! Zooming around on the ABEC 11 Kick Scooter is such a smooth experience. With premium ball bearings, each turn on the large wheels is smooth and speedy. Whether you are scooting for long or short distances, it is a wonderful experience. The handlebar heights are also adjustable so you can make it comfortable for you. The handlebars are made with high-quality materials which make them easy to hold even after hours of scooting. The board for wide enough for you to comfortably place your feet on it. With an anti-slip surface, you will experience high stability and safety while riding. The foot brake located at the rear wheel is responsive and allows you to safely brake whenever you need to. Want a high-quality kick scooter? Then definitely check the ABEC 11 Kick Scooter out! 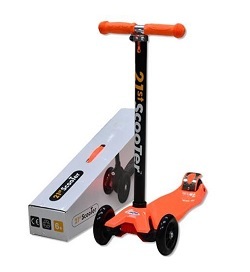 Click here to find out the latest price for the ABEC 11 Kick Scooter on Lazada today! Razor is probably the most well-known brand among all the kick scooters. If you were a kid in the 2000s, you would surely recognize this iconic brand. They have continued to innovate as seen in the Razor Jr T3 Scooter. It is one of the safest and most stable scooters made for kids. Even for first-timers, the Razor Jr T3 Scooter is easy to control and balance on. 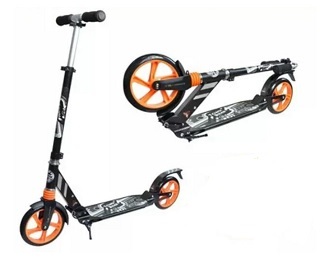 Click here to check the latest price for the Razor Jr T3 Scooter on Lazada! Your kid will enjoy his or her time with the wonderful Kick Scooter For Kids. With no need for batteries, its wheels will light up whenever your kid rides it around. It is a super fun experience. Also, the wheels are made with high-quality PU that work together with the ABEC5 ball bearing to give you a smooth riding experience wherever you are. It is no doubt that every aspect of the scooter has been tailored to make it fun and also safe for your child. 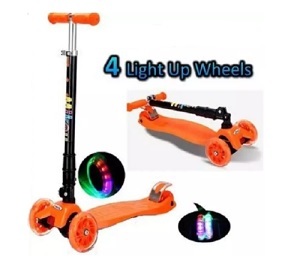 Click here to check the latest price for the Kid Scooter with LED Lights on Lazada today! If you are looking for a portable kick scooter, the Micro Maxi Scooter fits the bill. 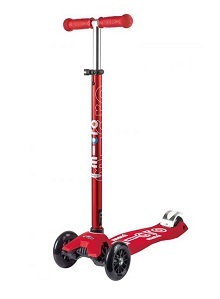 It weighs only 2.5kg which is around half less than other kick scooters. Carrying it around is a breeze even for your young kid. Even with its weight, it manages to be a very sturdy and stable scooter when your kid rides it around. It can even support riders of up to 70kg! Click here to check out the latest price for the Micro Maxi Deluxe Kids Scooter on Lazada! If you plan to ride for longer distances, the GlideCo Cruiser230 Kick Scooter is made for you. It is made with high-quality materials that last through even the toughest conditions. On the outside, it is protected by a scratch-resistant finish. The front of the scooter has suspension which makes riding on bumpy roads easier. With large 230mm wheels, you can move at faster speeds with less effort. When you need to fold it up, it takes a single second to get it folded or unfolded. Also, it comes with a shoulder strap so you can carry it around with ease. It is slightly pricier, but it is definitely worth it! 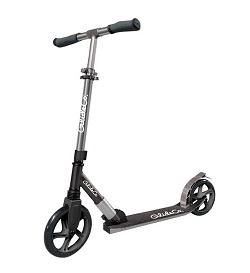 Click here to find out the latest price for the GlideCo Cruiser230 Kick Scooter on Lazada today! Where to buy kick scooters in Singapore? Our favourite and recommendation spot to buy a kick scooter is online. Most retailers will list all their stock online so you can compare prices easily. You can also use voucher codes to get a better deal. Our favourite is Lazada because of their LiveUp program which gives you rebates for your purchases. Click here to see all the kick scooters that are available on Lazada! Alternatively, you can check out places like Decathlon where you can try out the kick scooters before buying them. The kick scooter or push scooter looks like a cross between a skateboard and a bicycle. It has a thin board for you to balance on along with handlebars. There is also a brake located at the back wheel. Its power comes from its user using a leg to push off against the ground every few seconds. It has made a comeback now after being extremely popular in the early 2000s. The kick scooter is popular among both kids and adults. As such, there are models made specifically for kids and also models for adults. Many use them for short distance or last-mile commute or just as a fun way to exercise. How fast is a kick scooter? If you are planning to use a kick scooter for shorter commutes, you may be interested to know how fast it can go? Well, it depends on the person riding it. But let us give you a general idea. Our average walking speed is around 2km/h. On a kick scooter, an average adult should be able to reach speeds of 8 to 10km/h. As such, a kick scooter is around 4 to 5 times faster than walking and is about the same pace as a jog or run. Is a kick scooter good for exercise? Kick scooting is a decent form of exercise. You will need to use your legs, arms and also your core when balancing on the scooter. It is not a high-intensity workout but is more of a low to mid-intensity exercise depending on the speed that you ride at. Of course, running will burn more calories. However, riding on a kick scooter is infinitely more fun than running! Is a kick scooter safe? In general, kick scooters are pretty safe. Even in accidents, a large majority of the injuries are very minor cuts and scrapes. This is because of the relatively low speeds of a kick scooter. Also, it is effortless to control and manoeuvre a kick scooter even for first-timers or kids. If you are worried about safety, you can buy a helmet, knee and elbow pads and wear them while you are riding. With these safety devices, riding a kick scooter is close to 100% safe. Both kick scooters and electric scooter have a similar look. However, there are a few key difference between them. These differences will help you choose whether to buy a manual or electric scooter. A kick scooter is powered by your manual efforts (ie. your feet pushing against the ground). A motor powers an electric scooter. It is usually controlled by an accelerator located at the handlebars. As such, using a kick scooter is usually for much shorter distances because it can tire you out. But using a kick scooter can be a great exercise! Electric scooters can go for tens of kilometres on a single charge. If you are looking for a scooter for commuting, then they are the way to go. Kick scooters are slower than electric scooters. According to the law in Singapore, electric scooters can have a maximum speed cap of 25km/h. Even with this speed cap, they are much faster than kick scooters. The usual speed of a kick scooter is around 5 to 10km/h. Because of their lower speeds, a kick scooter is much safer than an electric scooter, especially for children. The acceleration of an electric scooter is really fast and can be hard to control especially for beginners and kids. If you are buying a scooter for your kids, a manual kick scooter would be the better and safer option.